My 1960 Mason had great topsides but the hull was rotted out below the waterline. In addition the transom was rotted as were the sides of the boat over the last foot or so before the transom. I decided to restore the bottom using West System cold molding. Replacing the ribs involved steam bending white oak and shaping it to eith replace of sister the existing ribs. The old ribs were bent and brittle but generally retained anough shape to allow me to make new ribs that had the proper shape. I constructed the new transom using a mahogany plank on the outside and built up mahogany plywood (1/8" x 4 plys) on the inside. The aft ends of the side plys were removed and new ones fashoned using layers of the 1/8" ply shaped to mimic the look of the original. With the ribs, side strips and transom replaced I built the bottom using three layers of 1/8 marine grade mahogany using the cold mold method. I temporarily stapled each piece to the previous layer until the epoxy cured and then removed the staples. It would have been much easier to use stainless steel staples and just leave them in the boat. I covered the bottom with one layer of fibreglass roaving using epoxy and then faired the hull using West epoxy and their fairing filler. The new hull below the waterline was very rigid while the old construction above the waterline was quite flexible. I worried that where the two methods joined would place considerable stress on the ribs so I stiffened the upper portion by filleting the strips where they overlapped. This seemd to do the trick giving me a solid and well sealed topside. It was a huge job and took far longer than I expected but I was also a complete novice that had to figure everything out from scratch. The new bottom is exceptionally strong and rigid. The only water that gets in is rain or spray. I have been using the boat for 10 years now. 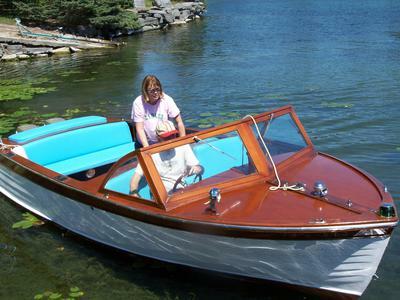 It is powered by dual 1973 Evinrude 50 Hp motors that run perfectly. Maintenance is minimal except for the varnishing - and there is a lot of varnish. I have a 1960 Oconto Cruisers that looks exactly like yours. I was giving it away and now wondering if I should.